Paros is a beautiful island in the West of the Cyclades, close to Naxos, Mykonos, Santorini, and Ios – in addition to being the heart of the Cyclades when arriving from Piraeus. Paros has an international airport (opened in 2016), however, most people still prefer to travel by ferry-boat. This beautiful island has a lot to offer its visitors and you may rest assured that your holidays in Paros shall remain unforgettable. Learn more . . .
Zefi villa is a perfect example of the local Cycladic and Parian architecture with the stone facades combined with the minimal contemporary design of modern comfort. Charming villa of 200 sq. m. comprised of 2 levels, 4 bedrooms, 2 bathrooms with shower+ 1 outdoor shower at the entrance of the dwelling. Located in the unit of the 3 villas sharing with villa Santa Maria a pool of 115m2. It accommodates up to 8 people. We welcome you to small Santa Maria, an area of exceptional beauty and to the Aeraki Villas apartment and villas complex...We are located on the northern part of Paros with a unique view to the crystal clear Aegean Sea and neighbouring island of Naxos, only 250 m. away from one of the most beautiful beaches of our island. The villas are situated in a low density and quite area in just 2km away from Naoussa, which is the second biggest town and the center of entertainment of the island. The villas are located 400m of the wonderful beaches of Filizi and XifaraVILLAS (1ST COMPLEX) Two settlements of large luxury self catering villas located in the area of Filizi, Santa Maria in Naoussa on Paros. A large villa built on two levels, that accommodates up to 8 people located in the beautiful area of Santa Maria, close to Naoussa on Paros. The whole villa is 130m2. The complex consists of 5 villas: A) The first villa is 110 sqm and can accommodate 4 to 6 people. It consists of two spacious double bedrooms, a large living room with a sofa bed, a fully equipped kitchen, two bathrooms with built in showera and a washbasin. The bedrooms and the living room are equipped with satellite LCD TV, DVD radio and A/C . Charming villa of 110 sq. m, 2 levels, 2 bedrooms, 1 bathroom + 1 WC + 1 outdoor shower at the entrance of the dwelling. Located in the unit of the 5 villas sharing a pool of 115 m2. It accommodates up to 5 people. The villa is air-conditionedOn the ground-floor we find a tastefully decorated living room with T.V. and fireplace, a fully equipped kitchen in a separate area , a W.
The villa has been built upon two levels and is 97 sqm in total with a 2000 sqm garden. On first floor there is a living room, a fully equipped kitchen with a dining table, a bathroom with a shower and a bedroom with two single beds. There is also a double, master en suite bedroom with a bathtub in the bathroom.Around there are large, furnished verandas which offer sea view. LocationAll six villas, two-story villas are all ideally located overlooking the bay of Naoussa on the island of Ascension in the foreground and famous and sheltered beach of " Kolymbithres " across.The distance from Naoussa is 1,5 km, from the port of Parikia is 8,5 km, and from the airport 25 km. Charming villa of 125 sq. m, air-conditioned , comprised of 3 levels , 3 bedrooms (one level is a mezzanine bedroom ), 2 bathrooms, and 1 outdoor shower at the entrance of the dwelling. Located in the unit of the 5 villas sharing a pool of 115m2. It accommodates up to 6 people.On the ground-floor , in the same area, we find a beautifully decorated sitting room with a plasma T.
Kavaki villa is located in a quiet spot above the main town of Paroikia, and offers fantastic sea views. Sunset is a wonderful experience from the huge terraces of this villa. As you enter from the entrance you enter in an open plan space with full equipped kitchen, bar and dining room with fireplace. Small art objects and decoration details create a special atmosphere. A medium sized villa built upon two levels on a total of 94 m2. Three bedrooms, two bathrooms, kitchen, living room. 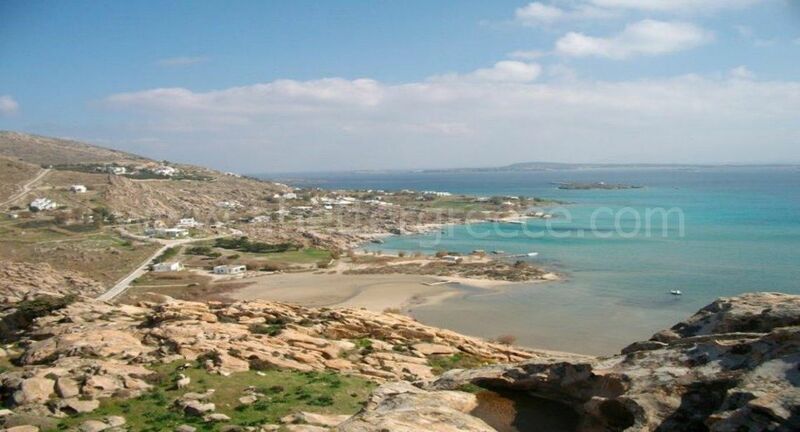 Located just a 5 minute walk away from the famous Santa Maria beach on Paros.